The International has its fair share of dodgy moments, but these are more than compensated for by an amusingly topical plot, some stunning photography and a thrilling shoot-out sequence. Directed by Tom Tykwer (Run, Lola, Run), The International stars Clive Owen as grizzled Interpol agent Louis Salinger, who's attempting to bring down the IBBC, one of the world's most powerful banks. Suspecting the bank of financing arms dealing and terrorism, Salinger thinks he's caught a break when one of his colleagues persuades a key player to testify, but when the agent and the witness are murdered, he finds himself right back at square one. Teaming up with Manhattan Assistant District Attorney Eleanor Whitman (Naomi Watts), Salinger travels to Italy and interviews an Italian politician, who is subsequently assassinated at a political rally. As Salinger and Whitman attempt to track down the hitman, they realise that their own lives are at risk, as the bank will stop at nothing to cover their tracks. Shot on High-Definition Digital Video (like Collateral), The International looks stunning throughout, thanks to Frank Griebe's crisp cinematography and some exceptional production design work that covers everything from intriguing locations to Owen's standard-issue Interpol raincoat. It also benefits from an amusingly topical plot – who doesn't want to see an evil bank brought down in these troubled times? In addition, Tykwer orchestrates some terrific set-pieces, most notably a thrilling shoot-out at New York's spiral-storeyed Guggenheim museum that is nothing short of inspired. Similarly, Owen makes a suitably gruff lead, even if he's not required to do much actual acting. That said, the film is not without its flaws – for one thing, the plot drags considerably in the middle section and is also overly reliant on ridiculous coincidences, such as the hitman randomly walking past the detectives at just at the right moment. 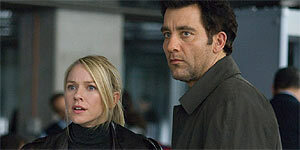 Similarly, Naomi Watts is completely wasted as Eleanor, as she's given almost nothing to do except provide exposition. The International is an enjoyable thriller that's worth seeing for the shoot-out sequence alone. Recommended.